For the Australian rules footballer, see Jesse Palmer (Australian footballer). Jesse Palmer in November 2010. Jesse James Palmer (born October 5, 1978) is a Canadian sports commentator and former college and professional football player who was a quarterback in the National Football League (NFL) for five seasons in the early 2000s. Palmer played college football for the University of Florida, and thereafter, he played professionally for the New York Giants and San Francisco 49ers in the NFL before spending half of the 2006 season with the Montreal Alouettes of the Canadian Football League (CFL). Palmer was cast in 2004 as the bachelor on the fifth season of the reality television series The Bachelor. He is now a college football analyst for ESPN/ABC in the United States and a football analyst for TSN in Canada. Palmer was born in Toronto, Ontario, and raised in Nepean, Ontario, a suburb of Ottawa. He attended both Confederation and St. Pius X high schools, although he played all of his amateur football on teams in the Ontario Minor Football Association and most importantly with the Myers Riders Football Club in Ottawa. His father, Bill Palmer, played for the Ottawa Rough Riders. His mother, Susan, was a prominent fashion and print model, co-founder of Barrett Palmer Models and former owner of the original ITM International Top Models, a modeling agency and training centre located in Ottawa (eventually became IMM International Model Management). Palmer accepted an athletic scholarship to attend the University of Florida in Gainesville, Florida, where he played for coach Steve Spurrier's Florida Gators football team from 1997 to 2000. Palmer often alternated playing time with quarterback Doug Johnson, and later, with quarterback Rex Grossman. Memorably, he connected with Bo Carroll on a 75-yard touchdown pass play, and rushed for four touchdowns against the Kentucky Wildcats in 2000. As a senior, he was selected as one of the team captains and received the Gators' Fergie Ferguson Award, recognizing the "senior football player who displays outstanding leadership, character and courage." He finished his four-year college career with 3,755 passing yards. Palmer graduated from the University of Florida in 2001 with two undergraduate degrees: a Bachelor of Arts degree in political science from the College of Liberal Arts and Sciences, and a Bachelor of Science degree in marketing from the College of Business Administration. Palmer was chosen by the New York Giants in the fourth round (125th overall pick) of the 2001 NFL Draft, and he played for the Giants for four seasons from 2001 to 2004. As a Giants quarterback, he spent most of his NFL career as a backup behind starter Kerry Collins. In 2003, he was sacked by Washington Redskins defensive end Bruce Smith, Smith's 199th career sack which enabled him to become the all-time career sack leader. After a four-year stint as a backup quarterback, he was cut on September 2, 2005 by the Giants. Palmer was the second Canadian (behind Mark Rypien of the Washington Redskins) to start at the quarterback position in the NFL. At first, wanting to stay in the game, he looked to the Canadian Football League for employment. His rights were held by the Montreal Alouettes; however, the Ottawa Renegades tried to acquire the Ottawa native as their top quarterback, and Palmer expressed interest in playing for his home town. Palmer's agent reportedly asked for a three-year contract in the neighborhood of $660,000 per year, which would have made Jesse the highest paid player in the league. Attempting to locate another opportunity to stay in the NFL, Palmer worked out with the Minnesota Vikings and Oakland Raiders and was temporarily signed by the San Francisco 49ers on November 1, 2005 as injuries plagued their quarterbacks Alex Smith and Ken Dorsey. Shortly after Dorsey and then Smith returned from injury Palmer was released, without playing a down. Palmer was re-signed a few months later by the 49ers during the 2006 off-season but was later released on August 29, 2006 toward the end of training camp. On September 11, 2006, the Montreal Alouettes signed him to their developmental roster. Palmer did not dress for a game with Montreal. He retired from the CFL before the start of the 2007 season to pursue a broadcasting career. In the spring of 2004, Palmer was the first professional athlete to appear on The Bachelor television program and the first non-American bachelor, in which he was given his choice of eligible single women. He accidentally forgot one woman's name during the first rose ceremony. He eventually selected Jessica Bowlin, but their courtship lasted for only a few months after the end of the show. Palmer was a color commentator for Fox for two games late in the 2005 season, and returned to the booth on November 26, 2006. On April 25, 2007, Palmer appeared on the NFL Network as an analyst and commentator for the weekend's NFL Draft. On May 24, 2007, Palmer announced his retirement from the Canadian Football League to pursue a broadcasting career with Fox. Palmer works for ESPN as a studio analyst on College Football Live and ABC telecasts, usually appearing with fellow Canadian John Saunders. He is a game analyst on ESPN Thursday Night College football games. He is also co-host on The Palmer and Pollack Show on ESPNU with former Georgia defensive end, David Pollack. On March 12, 2014, ESPN named Palmer and Brent Musburger as the lead game announcers for the forthcoming SEC Network. Palmer is also New York correspondent for CTV's entertainment news program, eTalk, covering both sports and entertainment events, including the Super Bowl and the 79th and 80th Academy Awards. Palmer was a studio analyst for ESPN's broadcast of the 2012 Cotton Bowl in Dallas, Texas, the 2010 Fiesta Bowl in Glendale, Arizona, and the 2009 Rose Bowl game in Pasadena, California. he is also an NFL analyst for TSN's "Monday Morning Quarterback" segment. Palmer guest starred in the Law & Order: Special Victims Unit season 7 episode "Design," portraying professional baseball player Don Lacey. He hosted the first two seasons of the food competition show Recipe to Riches on Food Network Canada. On May 19, 2015, Palmer joined Good Morning America as a "Special Contributor". Palmer has lived in Orlando, Florida since 2005. ↑ Profile, espnmediazone3.com; accessed February 12, 2015. ↑ Profile, tsn.ca; accessed February 12, 2015. ↑ Jesse Palmer profile, pro-football-reference.com; retrieved March 18, 2011. 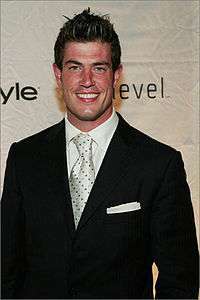 ↑ Jesse Palmer profile, databaseFootball.com; retrieved March 18, 2011. 1 2 3 2011 Florida Gators Football Media Guide, University Athletic Association, Gainesville, Florida, pp. 98, 99, 103, 125, 136, 138–139, 142, 144, 148, 152, 185 (2011). Retrieved August 31, 2011. ↑ Pro Football Hall of Fame, Draft History, 2001 National Football League Draft, profootballhof.com; retrieved April 13, 2011. ↑ National Football League, Historical Players, Jesse Palmer profile, nfl.com; retrieved April 13, 2011. ↑ LITSKY, Frank. "PRO FOOTBALL; With No. 199, Smith Becomes Sack Leader". NY TImes. Retrieved August 24, 2014. ↑ Giants release Palmer, sportingnews.com; accessed August 27, 2016. ↑ "Jesse Palmer announces retirement", yahoo.com; accessed June 17, 2016. ↑ "Brent Musburger, Jesse Palmer lead SEC team". ESPN.com. Retrieved March 12, 2014. ↑ Palmer profile, CTV.ca; accessed June 17, 2016. ↑ "TSN Talent - Jesse Palmer". TSN/Bell Media. Retrieved October 12, 2013. ↑ Recipe to Riches, huffingtonpost.ca, June 20, 2013; accessed June 17, 2016. ↑ "Corzine's Mix: Bold Ambitions, Rough Edges", nytimes.com; accessed August 27, 2016.